Ancient Delphi- The Navel of the World | Travel? Yes Please! Nestled between the rugged peak of Mount Parnassus and a spectacular valley of cypress and olive trees is Delphi, regarded by ancient Greeks as the most sacred site in the world. Delphi is said to have been founded by Zeus, who determined it to be the centre of the world. Mythology holds that Zeus released two eagles at opposite ends of the world and they flew to meet here, in Ancient Delphi. 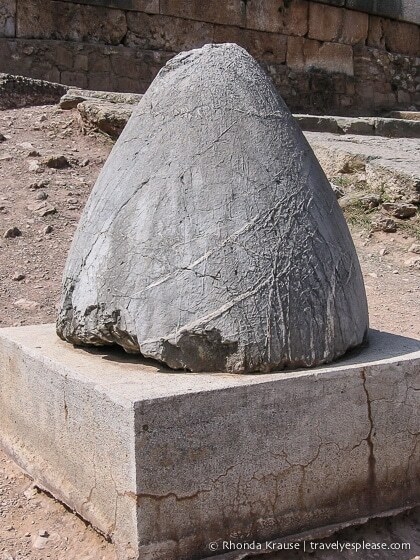 A stone, the Omphalos, marks the spot that the ancients considered to be the navel of the world. The one that stands in this spot today is a replica, the original being on display in the museum of Delphi. Not only the navel of the world, Delphi was also home to the most important oracle of ancient Greece. The Delphic oracle (the Pythia), believed to be the mouthpiece of Apollo himself, sat on a tripod over a chasm, inhaling fumes that were emitted from the earth. Intoxicated by the vapors, the oracle would enter into a trance-like state allowing Apollo to possess her spirit. In this state, she would mutter incomprehensible answers to advice seekers, which were then translated by a priest. Although her visions were often cryptic and ambiguous, people would still line up days in advance of the oracle’s appearance. As was common for major religious sites in Greece, Delphi hosted contests and athletic events to honour the Greek gods. The Pythian Games of Delphi began sometime between 591 and 585 BCE, eventually becoming one of the most important games in Greece, second only to Olympic Games in Olympia. Over its history, Delphi was attacked by the Persians and the Gauls before coming under control of the Romans. In 393 CE, a decree by Theodosius to close pagan sanctuaries resulted in Delphi’s gradual decline and eventual abandonment in the 7th century CE. The first modern excavations at Ancient Delphi started in 1880 and many important cultural and artistic discoveries led to it being named a UNESCO World Heritage Site in 1987. The site of Ancient Delphi consists of two Sanctuaries- the Sanctuary of Apollo and the Sanctuary of Athena (my personal favourite). There is also an onsite museum which contains a small treasure trove of collections from Ancient Delphi. Here are some highlights from my tour of the Delphi archaeological site! The Sanctuary of Apollo is the main and most visited site at Delphi. It contains numerous ruins such as treasuries, monuments, temples and a well preserved theatre. You will enter at the site of the old Roman Agora and walk along the Sacred Way past the Treasury of Athenians, Sybil Rock, Temple of Apollo and up to the theatre, built in a high corner of the sanctuary. The Sacred Way is lined with a large number of treasuries given by various Greek city states. These treasuries were built to commemorate important battle victories and contained offerings made to Apollo. The treasuries were also in part built to thank the oracle for her advice, which was thought to have helped win these battles. The most impressive treasury along the Sacred Way is the reconstructed Athenian Treasury. This small, Doric columned building was built to commemorate the Athenians’ victory at the Battle of Marathon in 490 BC. Also along the Sacred Way is Sybil Rock, claimed to be where the Sibyl sat to deliver her prophecies. The Delphic Sibyl was a renowned prophetic figure, not to be confused with the oracle of Apollo, who announced her prophecies at Delphi after the Trojan War. The Temple of Apollo once dominated over the Sanctuary in the 4th century BC. Inside the temple was the adyton, a special part of the temple reserved for the Pythia. The temple also had inscriptions of wise statements uttered by Greek philosophers, such as “Know Thyself” and “Nothing in Excess”. All that remains of this imposing temple today are the foundations and several Doric columns. The temple’s destruction in 390 AD came at the hands of Christian emperor Theodosius I, who destroyed the temple in the name of Christianity. Above the temple of Apollo is a well-preserved theatre that hosted performances of plays, poetry and music during the great festivals that were periodically held at Delphi. It was originally built in the 4th century BC, but the ruins visible today date from the Roman imperial period. Its 35 rows can accommodate around five thousand spectators. Make your way up to the top row for magnificent views of the sanctuary and valley below. From the theatre, continue up the path to the stadium, one of the best preserved in all of Greece. It was constructed in the 5th century BC and underwent remodeling in the 2nd century AD, at the expense of Herodes Atticus, who added the stone seats and arched entrance. Around 6500 spectators could fit in the stadium to enjoy events such as the Pythian and Pan-Hellenic games that were held here. The Sanctuary of Athena is about 800 metres from the main ruins at the Sanctuary of Apollo, but well worth the walk. I actually was the only one in my tour group who chose to run down to quickly see it before our bus left. Once I showed people the pictures, they all wished they had done the same! It’s hard for me not to gush when I describe the Sanctuary of Athena. Its Tholos is by far the most striking and graceful of all Delphi’s monuments. Backed by a valley of olive trees, the Tholos is the most picturesque spot at Delphi. All I wanted to do was sit and stare! The Tholos was built between 380 and 360 BC, possibly to shelter an important statue, although the exact purpose remains unknown. The Tholos originally consisted of 20 Doric columns around the perimeter of a three-stepped podium and 10 Corinthian half-columns in the interior. The three columns that stand have been re-erected. I couldn’t understand why the tour I was on didn’t take us to the Sanctuary of Athena and was cursing the fact that I had to race there and back as fast as I could, or risk being left behind. It’s the place that has always, and will forever stand out in my mind when I think about Delphi. Ancient Delphi is probably my favourite of all the archaeological sites in Greece I visited. I was fascinated by the mythical stories, still able to sense an air of mystery as I walked around the site. The inspiring ruins and the stunning setting adds to the allure of Delphi, a site that should not be missed on any visit to Greece. Ancient Delphi is located in upper central Greece on the southwestern slope of Mount Parnassus, overlooking the Phocis Valley. The modern town of Delphi is situated immediately west of the archaeological site and has several good hotels, making it a convenient base from which to visit Delphi. For your convenience, here is a list of hotels in Delphi. Ancient Delphi can also be visited as a day trip from Athens. It’s a scenic 2.5-hour drive northwest. Here is a trusted site where you can book tours of Delphi, including options as a day trip from Athens. These are a few highly rated ones I’ve picked out.